When it comes to quality and reliability, Excalibur is considered as one of the best food dehydrator brands on the market. The Excalibur 3948CDB takes the best from the past and combines it with digitized and computerized world into one roundup device. It is a mixture of all traditional characteristics and more. 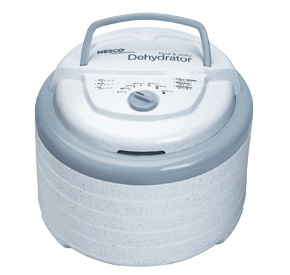 Why is a food dehydrator useful? A see-through door, build in 48-hour timer and a digital two times/temperature timer, we can already say that it is a worth while product. Square-shaped dehydrator that highlights nine removable trays and enables users more drying area opposed to the round food dehydrators.Meaning it supports the removal of its plates to make extra room for more substantial foods or rising bread with its big, 15 square feet of space. Well, there are many things we can take into account. It is expected that people only think of drying foods, but there is much more to it. Dehydrators are very versatile, you can even make pet foods with it or delicious beef jerky which is an amazing snack – high in protein, low in fat, as long as you limit the salts or various types of spice. You can make fruit leathers and here is how – take a fruit, blend it up, spread it across one of the sheets, dry it up and cut it. That is all, but if you want more fundamental guide read our other article on how to prepare fruit leather in a dehydrator. This snack is great for your kids or yourself. If you are following a raw diet or raw lifestyle you can make homemade crackers especially since this dehydrator goes from the range of 40 degrees where you can stay in that safe range and still get fresh foods. You can dry something like peppers then grind them up in grinder and use it as homemade spices. Dehydrating your food is healthier than the one bought in the department store,and yes we talk about the ones that add preservatives and sugar. Dried food preserves enzymes in the food and makes them last longer so you can use them for when you need them the most. For example, drying fruit at summer and using it at winter. The design is simple, but it works that way. It’s a box type case with a clear door at the front. The insides are made of stainless steel metal with the fan also made of the same material. It accommodates nine unexpandable plates for food storage that are made of poly-carbonate plastic. The Excalibur dehydrators come with mesh-like sheets used for various moist fruits or vegetables. Door is made of poly-carbonate. The device is not fully closed as it has gaps between the door and housing which allows the humidity to escape, without them it would not dry or work as it should. The trays can be removed easily, and because of that you will never have a problem with placing them into the device.They are also clear which is nice as it allows to keep track of your progress without the need of opening the door. The controls for the temperature and timer are placed on the top back of the device, and that is something we don’t like since it can’t be placed in the cabinet much like a wall microwave or a stove. The device is FDA-approved, so it does not have harmful fumes at the temperature on which the dehydrator runs. Unlike other dehydrators that have their heat source placed on the bottom of the device Excalibur has the fan and the motor set on the back. This is an advantage because if the heat only comes from the bottom while the hot air reaches the top it might not be as heated as it initially started so you will have to rotate your treys. With the Excalibur 3948CDB, you are not faced with that problem since it circulates the heat evenly. The best feature of any Excalibur product is its trademarked Hyperwave technology. It means the device fluctuates the temperature within approximately 10-degrees range to help dehydrate food faster. Without this what happens is that the food will be dried and it will create a crest on the outside of the item where the inside shall stay moist. Hyperwave helps in shortening your time dehydrating. You can set the temperature up from 95°F up to 165°F. 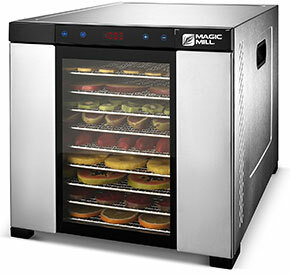 This is well enough because most food should not be dried on more than 118°F to prevent the destruction of food enzymes.For making meat jerky, a minimum requirement is about 160° F.
The Excalibur 3948cdb has a digital 48h timer which is an upgrade over the various previous models since it is programmable. The timer grants the buyer to take advantage of 2-time and 2-temperature setting for dehydrating. The dehydrator can be set in such a way that it has a high temperature for a certain period ( let us say about 5 hours on 140°F) and then to a reduced temperature (for example 20 hours on 111°F ). So, for those first 5 hours, we take advantage of the high heat that’s set to raise the air temp immediately. The moisture surface could evaporate and avoid growth of bacteria or mold.Later on, when the timer switches to lower setting, humidity from inside of the item can be drawn to the topside and disperse in an even aspect. The timer also features a build in memory system that allows it to recall its stage settings in the power interruption incident; it also means that you can freely open the door without any interruptions on the timer settings unlike on some dehydrators. The benefit of having a built-in timer is that once the dehydration process is over the device will automatically shut itself off.Once the clock runs down to zero, there is no need to watch over it and wake up in the middle of the night to shut it down. It is 12.5 inches in height and 17 by 19 inches in width and depth. Like many other nine trays dehydrators, this one also has a massive capacity for all sorts of items with its 15 square feet of space. Each plate is 15’’ by 15’’. They are easily removable for making more storage for some more substantial foods, plus the trays are dishwasher friendly and easy to clean. This model is only available in black color. Over the years Excalibur has earned itself a reputation for quality, and although they may be simple built, they provide good quality. The customer’s service at Excalibur is fantastic and if you by any chance get a lousy product or faulty machine all you have to do is contact the manufacturer, and they are going to send you a new one in the shortest period possible. With its ten-year warranty, there is not much to say about it. The trays are mesh featured,so it is not great for drying any liquid foods like soups, sauces, or tiny substances that can fall through the mesh. To prevent this, the Excalibur also sells non-sticky lining for the plates covered with Teflon. Unfortunately, they are sold separately. With the unit, you also get the user manual with basic instructions, some guides and tips and a collection of recipes. Also, a helpful and a nice bonus is a book called Preserve it. Naturally it has a lot of information which are included in color photos and detailed directions for dehydrating all sorts of food and a lot more. If you like eating healthy or you want to change your lifestyle and eating habits, you should get the Excalibur 3948CDB. It’s a quality device, reliable, user-friendly dehydrator and if you don’t mind the extra price for its excellent features, this is a machine for you. Whether you plan on using it professionally for business or at home dehydrating your food will pay the device in no time.